— Public comments opposing de facto permanent parking lot dump at WCS, TX needed by March 13! Waste Control Specialists (WCS) in West Texas has applied to the U.S. Nuclear Regulatory Commission (NRC) for a license to construct and operate a “centralized interim storage facility” for 40,000 metric tons of commercial irradiated nuclear fuel, more than half of what exists in the U.S. The “host” county, Andrews, has a large Latin American population, as well as many low income residents; so too does Eunice, New Mexico, just four miles from WCS across the state border. This de facto permanent parking lot dump would launch 4,000 high-risk Mobile Chernobyl train car shipments, traveling through most states (see map, right; click here for a larger version). A significant number would initially travel by barge on surface waters — Floating Fukushimas on lakes, rivers, and seacoasts — just to reach the nearest rail head. Dirty Bomb on Wheels security risks would abound. On Thurs., Feb. 23, from 1-4pm Eastern, NRC will hold an environmental scoping public comment opportunity, accessible by call-in teleconference and/or Webinar (in-person attendance is also an option for those near enough NRC’s HQ in Rockville, MD). NRC’s Webinar link will go live in real time. The toll free call-in/teleconference number is (800) 619-9084; Passcode 3009542. The region around WCS has a high proportion of low income, Latin American residents, and is already heavily burdened with nuclear activities and dirty fossil fuel industries. 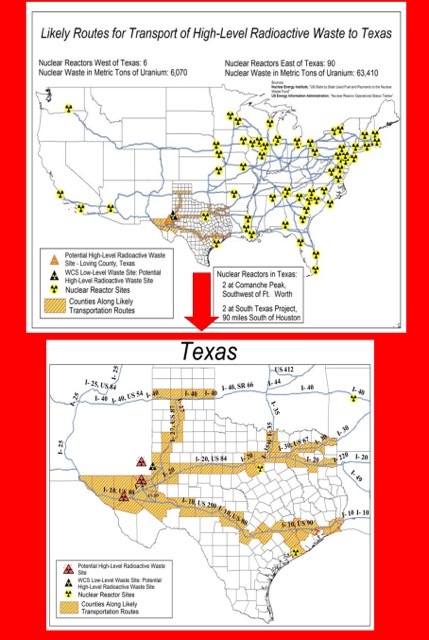 WCS would launch unprecedented numbers of irradiated nuclear fuel train and barge shipments through many states. Please see entries below on Beyond Nuclear’s Centralized Interim Storage website section, for more information. The U.S. Nuclear Regulatory Commission (NRC) has, at long last, published the announcement for its quickly approaching HQ meeting, at its Rockville, MD HQ, re: WCS, TX’s environmental scoping public comment opportunity, to be held on Thursday, February 23, 2017. Please attend in person if you can, or by Webcast/Teleconference Call-In. Please pre-register in advance to make oral public comments for the official record, raising various concerns in opposition to WCS’s application. Members of the public who will attend the meeting in person, and those wishing to present oral comments [via Webcast and/or teleconference/call-in] may register in advance by contacting Mrs. Debra Miller at (301) 415-7359, or by email to Debra.Miller@nrc.gov, no later than February 21, 2017. Those comments may be limited by the time available, depending on the number of persons who wish to speak. Please provide name and company or organization for each attendee. Arrive 30 minutes early to allow time for security registration. [Please see entries below, for more background details and links to additional information. Please attend by watching the webcast and/or calling in. Please sign up to make comments at the meeting. Additional written comments can be made until March 13th. Legal intervention deadline is March 31st (or forever hold your peace). See entries below for links to more info. A seawater leak at Pilgrim Nuclear Power Station has prompted plant operators to sharply reduce energy output there. Control room operators reduced power to about 50 percent on Monday afternoon, Feb. 6, after there was an indication of a leakage into the Plymouth plant’s condenser. A power plant spokesman told the News Service on Tuesday morning that the plant is now operating at 28 percent while repair work is undertaken. Entergy Pilgrim Station spokesman Patrick O’Brien did not have an estimate of how much seawater leaked into the plant’s condenser. Pilgrim experienced a similar seawater intrusion last year, O’Brien said. After a final planned refueling the plant this year, Pilgrim owner Entergy plans to shut the plant down in 2019. Critics of the plant point to repeated problems there that have necessitated shutdowns as proof that the plant should close now. Pilgrim officials say the plant is safe and have repeated over the years that the safety of the public and plant staff has not been put at risk. The coastal power plant closed down for a week in December to repair a steam leak. The plant was also in the news recently after media outlets obtained an internal Nuclear Regulatory Commission email documenting safety concerns found at the plant during an NRC inspection in December. The email detailed “poor maintenance, poor engineering practices, and equipment reliability problems” at the plant, which can produce 680 megawatts of power using its boiling water reactor.